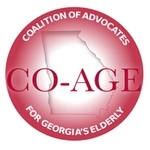 The Georgia Council on Aging had hoped that the legislature would approve new funding for Home and Community Based Services (HCBS) and for the Aging and Disability Resource Centers (ADRCs.) While the lack of funding HCBS was surprising because of 12,000 people on the waiting list, the legislature’s lack of support for the ADRCs was particularly disheartening. The grants that funded the 21 ADRCs in the state are expiring, and there will be no dedicated state funding. Without funding, phone calls will go unanswered or returned, and more people will go into nursing homes. On the positive side, the Personal Needs Allowance for Medicaid nursing home residents did receive a small bump, up to $65 per month from $50 per month for all of their personal needs. Adult Day Health Care centers received a rate increase along with CCSP Alternative Living Services. HB 803, sponsored by Rep. Wendall Willard (R, North Fulton), prohibits trafficking of older or disabled persons. Trafficking targets vulnerable adults to gain access to their monthly benefits and perpetrate various types of abuse and fraud. The bill makes it illegal to move clients to different facilities to avoid detection by law enforcement and to take all of a client’s financial resources for their own use. According to GBI Director Vernon Keenan, Georgia has seen more than 3,000 people charged with elder abuse crimes since 2010. Georgia now has some of the nation’s strongest laws to protect elderly and disabled adults. While elder abuse laws on the books already make it a felony to abuse or exploit vulnerable adults, we had no specific statute making it a crime to traffic older adults or disabled persons. This law gives investigators and district attorneys another tool to prosecute those who would mistreat disabled persons and older adults. A third important piece of legislation is HB 635 which authorizes district attorneys in each judicial circuit to establish an Adult Abuse, Neglect and Exploitation Multidisciplinary Team to coordinate investigations and responses to a suspected elder or disabled adult abuse, neglect or exploitation. These multi-agency teams will be able to work collaboratively to address elder abuse or neglect. Transit governance and funding was a popular topic this year. The transit bill, HB 930, is a big win for all Georgians. GCOA successfully advocated with sponsors to allow senior transportation services access to transit funding. the creation of a Georgia Alzheimer’s and Related Dementias Advisory Council.